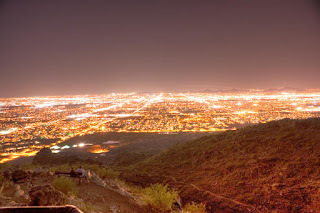 I thought it would be interesting to go up onto South Mountain and take some night pictures of the city. This first Pic was taken with a 30 second exposure, and processed into an HDR pic. This is also a 30 second exposure, enhanced with Photoshop. This one is a 30 second exposure and I set off the flash in the middle of it to bring out the nearby objects. 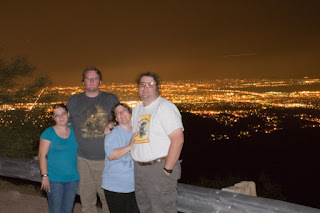 The final picture was a 30 second exposure with the flash set to rear synch, and triggered with my wireless remote. While up there we noticed the smell of something burning. Recently Kathi and I wanted to take our trailer and go camping. 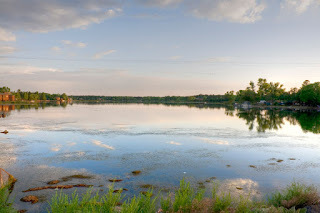 We wanted to camp at Woods Canyon Lake, but they are booked till August. After some searching I found a campsite in Lakeside that had openings. 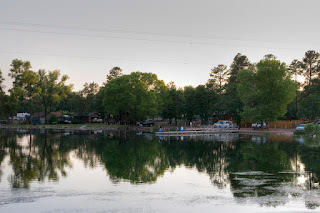 Last Friday we went up to Lakeside and stayed at the Lakeside campground. I have no pictures of it as it was pretty boring, plus all the camp sites were crammed very close together. If we had brought a tent we would have had no place to set it up, as the space available was taken up by the picnic table, fire pit, and trees. We left town around 13:30 and arrived at around 17:30 18:00. 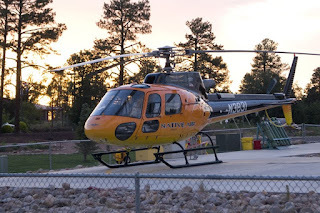 When planning the trip I found there were 2 routes to get to Lakeside, one went through Payson and the other went through the Fort Apache Indian Reservation. My Mapping software insisted that going through the Fort Apache Indian Reservation was the faster route, but once I told it not to use any dirt roads It gave the distance as 184.7 miles. I then had it run the route through Payson and I got a distance of 184.7 miles?! So... given the choice we went through Payson. The trip was very hot, and climbing the 6% grades with a trailer had the engine running quite warm, however once at the top of the rim it was smooth sailing to Lakeside. 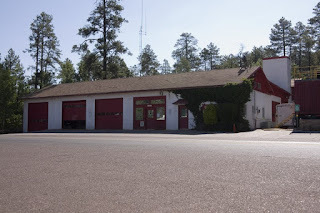 As we went through Payson the temperature was 102. This time we left with time to spare and took our time setting up camp. Because of the fire danger in Payson being Extreme I stopped at the Payosn Walmart and picked up a portable propane BBQ. I had to assemble it, and we made hamburgers for dinner. We went to sleep shortly after the sun went down. We did not light a fire as it was very warm. The next morning we were up with the sun I made breakfast and after a quick shower in our camper we headed out to rainbow lake as I wanted to do some fishing and maybe catch Crayfish. However Public access to the lake is mostly restricted to the north side. There was very little space to fish from and most of it was in use or the water was shallow or choked with weeds. I looked for crayfish but only saw dead or the remains of dead crayfish. Kathi looked into renting a boat but they were not renting because of the weed problem. So instead we went for a drive to Show Low lake, I do not have a picture of the lake but the lake is designed as reservoir and it had steep sides lined with boulders, once again access to shore fishing was very limited. So we went to see if we could find Kathi's friend Suzie's mothers cabin as it is for sale. The cabin is located in a nice little wooded neighborhood in Lakeside, I did not take a picture of it, the cabin consists of an old single wide trailer with an add on on the front. A neighbor reported that it was in need of a lot of repair. We went back to camp I made dinner (Ribeye steaks), and we went to bed shortly after sundown. 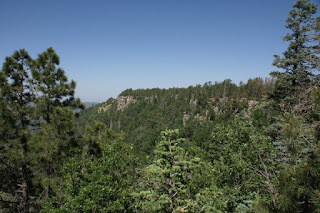 I didn't take many pictures since when you have seen one pine tree you've seen them all, as illustrated by this picture I took at the Mogollon rim overlook just before you head down from the rim. The trip home was uneventful. 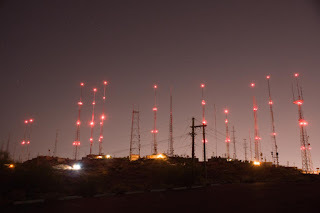 This last weekend I had to go to Flagstaff on Friday June 6th for non recreational purposes. I finished setting up the kiosk at the Flagstaff mall at about 1pm, and Kathi and I had lunch at a Mexican restaurant (the name escapes me). 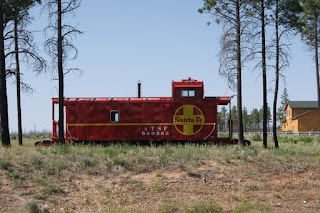 We visited the Flagstaff train depo and did some train watching. 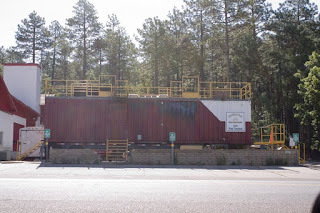 I estimate that in the town of Flagstaff a train goes by on average every 10 to 15 minutes. We then had a light dinner at the Village inn next to the Super 8 motel we stayed at. Here is the view of from our second story window. Yup that's right... Burma Shave signs. We got to Kingman (and it was boring). We did find this small park with a Locomotive in it. Next to the park was an old electric generating plant, now a museum. We stopped in to use their bathroom, but did not go into the museum, of course there was a train running nearby. Kathi took some video as well. 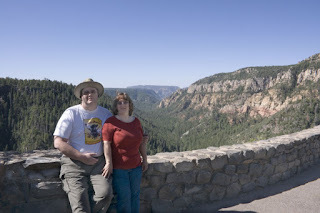 The next day we checked out and headed for Sedona We stopped at a scenic overlook, I took a picture of us and an HDR picture of the Scenery. 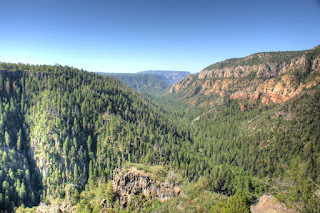 We passed through Oak Creek Canyon, and stopped in Sedona for about 45 minutes. We didn't stay very long. I was extremely tired and I didn't even take any pictures. The rest of the ride home was the usual heavy Sunday traffic.